Netflix continues to lead the FAANG companies in terms of original content, though the Facebook, Apple and Google-owned YouTube platforms are also making “unprecedented strides” in original content production. This is according to new research by Ampere Analysis, which shines a light on both the number of originals that the FAANGs are working on and the genre skews that make up these multi-billion-dollar investment efforts. 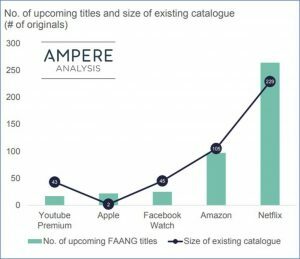 Netflix is leading on the commissioning front with more than 250 upcoming titles – a figure that will more than double its originals catalogue, according to Ampere. Apple, YouTube and Facebook have 65 upcoming original titles between them, while YouTube has promised it will have 50 originals by the end of 2019. Netflix has been maintaining its focus on comedy and sci-fi commissions – youth-skewing genres that have performed well for the company via shows like Stranger Things, Master of None and BoJack Horseman. Amazon was found to be committing a higher proportion of new commissions to drama titles at 29% of upcoming titles compared to Netflix’s 17%. Apple meanwhile is emulating Amazon and Netflix with sci-fi its top genre for commissions, as seen by shows like its forthcoming reboot of Stephen Spielberg’s Amazing Stories. YouTube and Facebook are upping their volume of scripted content, with YouTube Premium focusing on youth-orientated comedy. Reality content makes up just 6% of their new commissions compared to 32% of their current catalogue, according to the research. Across all the FAANGs, comedy was found to be the most-commissioned genre overall. 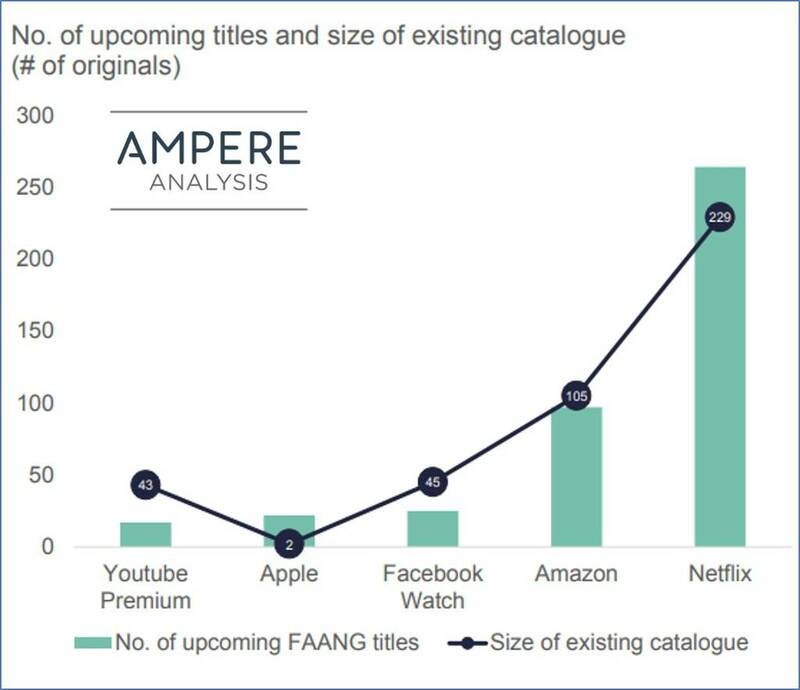 “With so much new content being produced across a range of subscription services, the FAANG group are under increasing pressure to create content that not only attracts new audiences but also prevents existing consumers from churning,” said Ampere analyst Richard Cooper. “All the major players have been expanding the number of original commissions in the face of an increasingly competitive market. Netflix is set to more than double its originals catalogue, as is Apple.